It was 1977, and although nobody knew it at the time, psychologist Ellen Langer and her research team at Harvard University were about to conduct a study that would change our understanding of human behavior. It all started when Langer asked her research assistants to cut in front of innocent people waiting in line at the photocopiers in the library. You'll notice that version three didn't make much sense. Using the phrase “because I have to make copies” was a fairly useless reason for skipping the line. Everyone waiting at the photocopier needed to make copies. The phrase contained no new information, but the researcher was trying to use it to justify the favor anyway. Surprisingly, this senseless reason performed well. When the researchers analyzed the data, they found the following: For version one, 60 percent of people let the researcher skip the line. For version two, 94 percent of people let the researcher skip ahead in line. For version three, 93 percent of people let the researcher skip ahead in line. 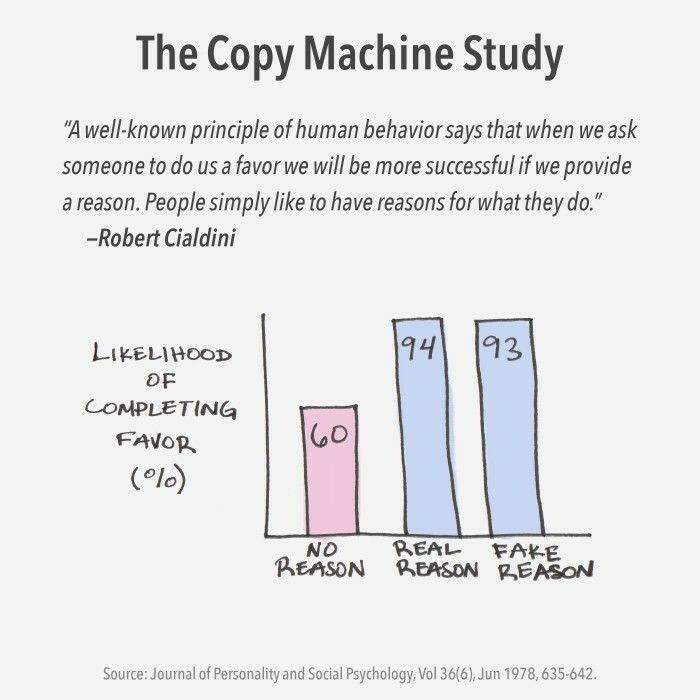 Langer's research, which became known as "The Copy Machine Study," was published in the Journal of Personality and Social Psychology. The study became famous because it uncovered one of the most powerful words we use to drive our behavior: because. Langer's work proved that as long as we could justify a behavior in our brains (“I'm doing this because”), we would perform the behavior, even if the reason didn't make sense. Similar feedback came from other attendees, and the pervading wisdom was that people want to build better habits all the time, and it can be easy to fall off track with your goals. Hosting the seminar multiple times throughout the year could be a good way to pull everyone back on track. As soon as I heard the feedback, I realized it was logical. Yet, for all that time, I've been justifying my behavior of only conducting one seminar per year with reasoning that didn't make sense. Even more surprisingly, I never questioned myself simply because I had a reason, even if it wasn't a good one. I'd venture to say that we do this to ourselves in many areas of life. How are you justifying not exercising consistently? What is your reason for why you can't write each day? How is your mindset preventing you from reaching the next level? The reasons that we use to guide our behavior are just stories that we tell ourselves. Sometimes, those stories are true and accurate. We all have reasons for why now isn't the right time for that bold move, why we slip up on habits we say are important to us and yes, why we do favors for strangers. What we often fail to realize, however, is that our behaviors can just as easily be driven by irrational reasons as logical ones.